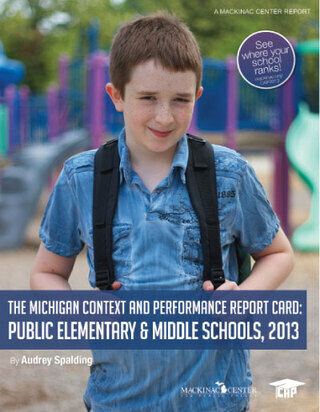 The Michigan Context and Performance Report Card measures school performance by adjusting standardized test scores to account for student background. Comparing schools using unadjusted test scores ignores the significant relationship between academic performance and student socioeconomic background — a dynamic outside a school’s control. The carefully adjusted “CAP Scores” in this report card allow parents, educators and the general public to better compare performance among schools serving the various student populations in, say, Saginaw, Ann Arbor and Escanaba. CAP Scores do not penalize schools in lower-income areas. This report card ranks 2,362 Michigan elementary and middle schools and relies on methodology developed by researchers at the University of Arkansas. CAP Scores are developed through a statistical regression of the schools’ average scores on the tests produced by the Michigan Educational Assessment Program and the percentage of the schools’ students at the grade level tested who were eligible for free lunch under the federal government’s National School Lunch Program. Eligibility for a federally subsidized free lunch is frequently used by education researchers to measure a student’s family income. This report card incorporated MEAP subject tests administered in years 2009, 2010, 2011 and 2012 to students in grades three through eight. Schools that serve primarily students with special needs were excluded from this analysis. The Overall CAP Scores were used to generate letter grades for each school using a standard bell curve. Ten percent of schools received an A; 20 percent received a B; 40 percent, a C; 20 percent, a D; and 10 percent, an F.
Detroit City School District’s Thirkell Elementary received the highest Overall CAP Score in the state (136.98) and earned an A. The next four schools among the top five were Iris Becker Elementary School (Dearborn), Crestwood Accelerated Program (a selective school in the Crestwood district), Webster Elementary School (Livonia) and Lowrey Middle School (Dearborn). Burns Elementary-Middle School, formerly a Detroit City school and now under the oversight of the statewide Education Achievement Authority, had the lowest CAP Score in the state (73.27) and received an F. The next-lowest schools were EMAN Hamilton Academy (a Detroit charter school), Trix Elementary (EAA), Stewart Elementary (EAA) and Bay City Academy-YMCA Campus. Four of these five schools had data only for 2012 and appear to have opened recently. This report card also sorts schools by their “locale,” using categories established by the U.S. Census Bureau and the National Center for Education Statistics. Schools were categorized as city, suburban, town or rural schools. Elementary and middle schools located in towns had the highest average Overall CAP Score (100.10), followed by suburban schools (100.09), city schools (99.90) and rural schools (99.86).